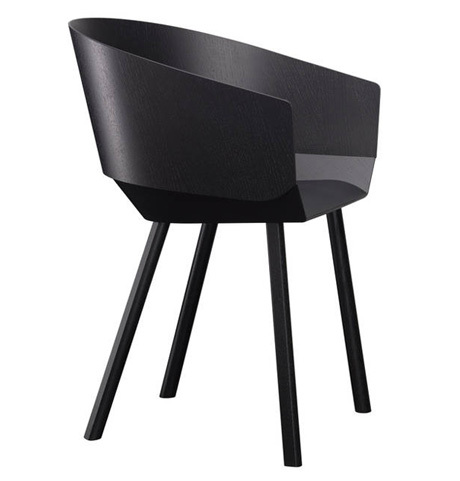 German designer Stefan Diez is the brainchild behind the Houdini Chair. Conjuring metallization, the willowy seat is actually made of angularly fashioned, flattened, wooden slabs. This year, at London’s “Show 4 – Food For Thought”, local chefs have been assigned to create menus for specific designer chairs. Sam Clark of Moro, a Moorish restaurant, analogized the Houdini with the notion of a grill or barbecue. One couldn’t agree more, the chair’s contours are more than reminiscent of a Weber grill of some sort. 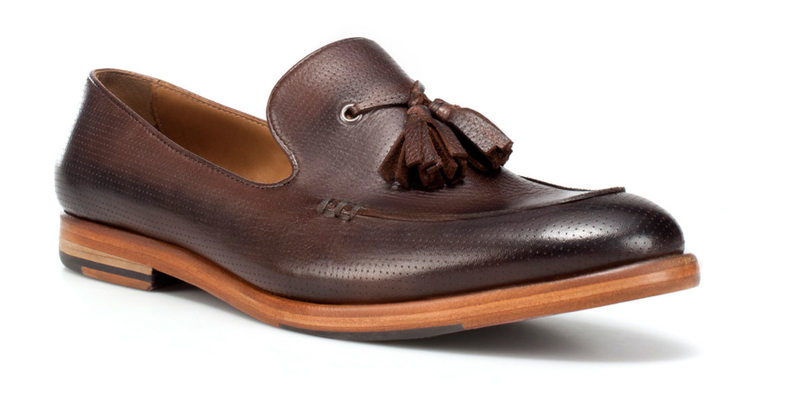 A cool take on heritage leather, textured with a little bit of flair, and an unconventional, organic silhouette. In a city where one gets easily accustomed to the commonplace affectations that ooze from many-a-food establishment, our palettes become discerning and persnickety, snubbing an entire dining experience due to a substandard wine pairing or rackety acoustics. Thus we retort, romanticizing the simplest of things, mac and cheese being the most jeweled of comfort American eats, or, even Kraft Foods’s portfolio. Sarita’s Mac and Cheese, otherwise known as S’MAC, is located in the East Village, capitalizing on the comfort food formula, all the while satisfying the cheese obsessed. The restaurant glimmers of warm oranges and yellows, as the silhouette of a cast-iron skillet emblazons a S’MAC type treatment. In this kitchen, gruyere meets star-spangled cheddar, a whole-wheat-bread-crumb-free option is made available, and international modifications to the pasta and cheese laden dish are encouraged. Masala mac and cheese anyone? Beat the crowds, head to the take out section, a store or two down from the main shop, and get your mac and cheese to go. Even better and more comfortable, if the weather permits, nosh on the East Village streets. 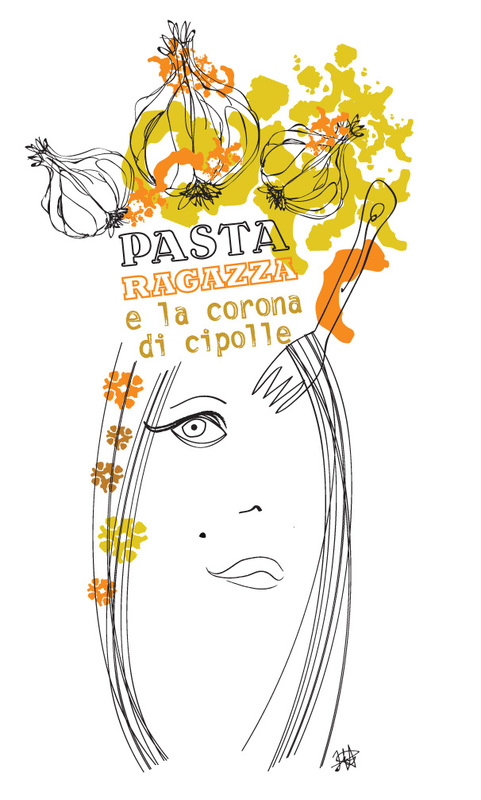 Pasta Girl and The Crown of Onions, or in my humble, horrible, Italian, La Pasta Ragazza e la Corona di Cipolle, is the leading food hero of this blog. Quietly she has sat beneath Smoke Man for sometime now (see the top right part of this page) and she’s asked to officially introduce herself in a post. 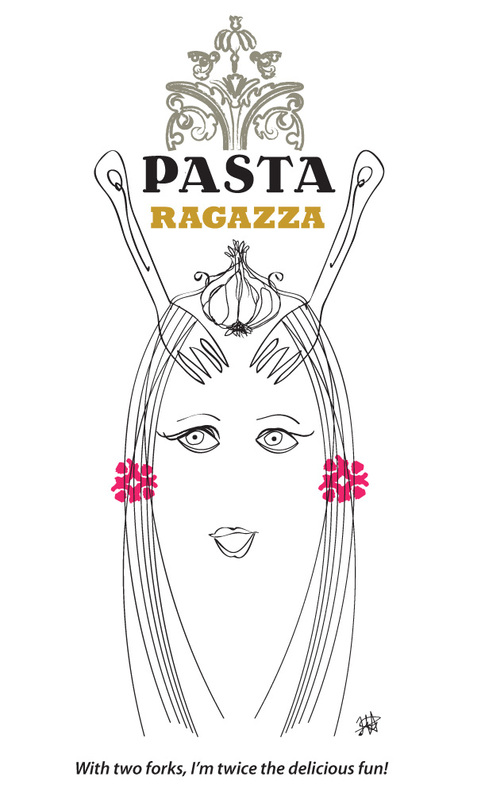 La Pasta Ragazza was initially instituted as a face for a conceptual line of Italian food products, or even a restaurant. Her accessories are a fork which doubles up as a comb, a crown of onions, and some infused splotches of sorts. Sometimes, when she’s worked up an appetite, she’ll appear with two forks in her delicious angel hair. 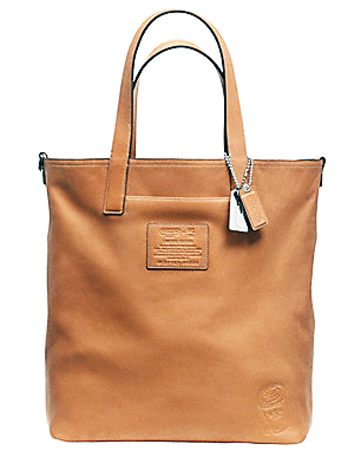 British, New York based illustrator Hugo Guinness has partnered with Coach to produce a limited range of leather goods for men. 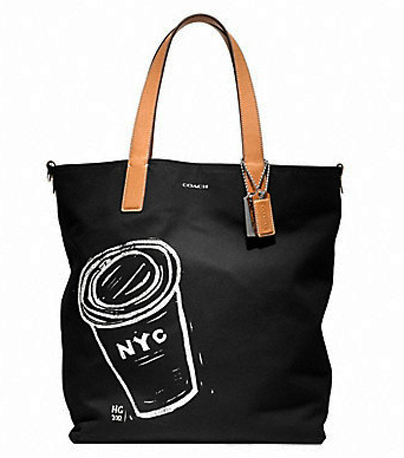 The most prized, in my opinion, is this Coffee Cup reversible tote. 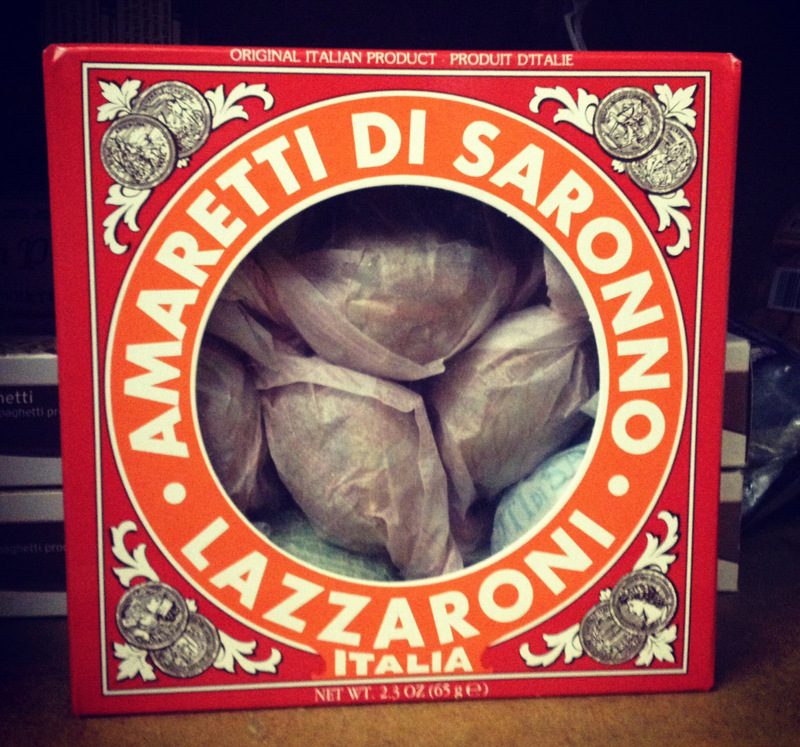 In a metallic tin or a packaged paper product, Amaretti di Saronno by Lazzaroni is twice the diminutively delicious amaretto macaroon. The hollow, hard, and small biscuits come fashionably enveloped in two’s, making them the sweetest partner to your morning espresso crime. Unquestionably Italian, the product’s packaging exhibits elements of the Renaissance (which is, according to legend when the cookie was created) as ornate coin illustrations flank a contrastive, concentric, sans-serif type treatment. This style is quintessential of Italian graphic design, harking to the Starbucks logo, prior to its most recent facelift. The brand unabashedly borrows its branded coffee experience from the espresso bars of Italy. A v-neck suggestive of rust and sunnier days with just the right hint of flamboyance.